The birth of Robin Halpern's passion for art emerged during adolescence. It began with squiggles and line drawings morphing into colorful creations using pen and brilliant colors of India ink. There were many art classes, and eventually university where she earned a Bachelor of Fine Arts degree in painting. Exploration of a variety of media including drawing, painting, collage, sculpture, photography, printmaking and ceramics were all useful in the evolution of the artist she was to become. Following art school and not prepared to nurture this passion head on, she became drawn to the interior world of the human psyche. Although her passion for expression through the visual arts took a back seat to her years of studies in becoming a psychotherapist, her particular creative lens continued to inform and influence everything she encountered. Over the years, she returned to her art and discovered that it is through the medium of painting that she is best able to communicate the bold visual imagery that has become the vehicle for her artistic expression. As a link to her work as a psychotherapist and derived from her particular lens, her art depicts the interior world of emotion and mood. defines ALL of her work. 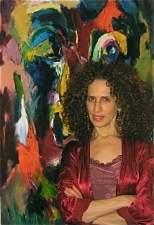 Her work hangs in private collections throughout the country.